The Do’s and Don’ts of Graduate Studies: Maxims from the Chair from the book The Education of a Photographer by Charles H Traub, Chair at School of Visual Arts’ MFA Photography, Video and Related Media Department in New York. The 14th edition of Paris Photo turned the spotlight on central Europe – Czech Republic, Hungary, Poland, Slovenia and Slovakia – and included 106 exhibitors from 25 countries. Some 38,000 visitors came to the fair, compared to 40,150 in 2009, a slight decrease in number owing to the fact that there was no late night opening this year. Transactions went at a sustained pace and most exhibitors reported a better volume of sales compared to 2009. Some achieved results that were described as "exceptional," "astonishing," "miraculous," by the gallery owners themselves whose expectations were modest owing to the prevailing economic climate. Sales were good, and even excellent, especially for those galleries whose shows coincided with some of the exhibitions currently on in Paris (Heinrich Kühn at the Musée de l’Orangerie, André Kertesz at the Jeu de Paume, Les Primitifs de la photographie at the Bibliothèque Nationale de France) as well as the big photography auctions and the Central European theme. The photograph by Joseph Sudek put up for auction by Johannes Faber gallery went for a record €300,750 at the Sotheby’s sale. This brought numerous buyers to the Viennese gallery’s booth at Paris Photo. Another image by the Czech artist went for €190,000. Meanwhile, the New York gallery Edwynn Houk, sold the picture entitled Arles (1929) by Hungary’s Moholy-Nagy for US$ 265,000. Budapest’s Vintage Gallery was showing largely Hungarian modernists and achieved better sales than last year with a total of €58,000 for 22 vintage pieces sold. France’s Françoise Paviot sold her self portrait of Man Ray for €75,000 and the entire set of small contacts by Brassaï made in 1958 for between €2,500 and €4,000 each. Obsis gallery of Paris sold its entire collection of images of the 1931 colonial exhibition held in Paris to a Paris museum for more than €100,000. A specialist in anonymous photography, the gallery Lumière des Roses (Montreuil) sold two thirds of the works on its booth, and in particular 8 autochromes (1925/1930) by Léon Gimpel at €7,000 each. Surfing on the current wave of enthusiasm for photographers who worked in fashion (Avedon, Irving Penn, Guy Bourdin, Helmut Newton...), Hamiltons Gallery of London sold the famous Mainbocher Corset (1939) by Horst P.Horst for US$ 150,000. Filles du Calvaire (Paris) gallery recorded its best sales ever at this year´s Paris Photo. The gallery let go of three editions of a portrait by Paul Graham from his End of an Age Series, 1996-1998 at €24,000 a piece to buyers who included some Turkish newcomers to the fair. SAGE Paris sold his entire collection of the light-boxes made in 1999 by Japan’s Naoya Hatakeyama, ie. some 30 works costing €6,000 each which went to the Getty Museum in Los Angeles, the Museum of Fine Arts in Houston and to a Brazilian foundation. Berlin’s DNA gallery sold 80% of its wares including two large format staged images by Japan’s Tatsumi Orimoto at €38,000 each and two videos by Bulgarian artist Mariana Vassileva costing € 8,000 each. New York’s Yossi Milo recorded better sales than at his last participation in Paris Photo in 2006 with some 40 works priced at between €6,000 and €10,000 acquired by new collectors from England, the USA and France. With its artist Gábor Ősz as the winner of the 2010 BMW-Paris Photo Prize, Loevenbruck (Paris) found buyers for four of the Hungarian’s unique pieces at €20,000 each. Book sellers also reported very good sales this year: Toluca sold 20 of its 28 copies of « What Man is really like » by Rachel Whiteread, Ingo Shulze and Naoto Fukusawa for €7,000 each. Librairie 213 let go of some 20 rare books with the most expensive costing €12,000. Man Ray’s book entitled Electricity (1932) offered by Denis Ozanne at €35,000 also found a buyer. Visitors, collectors, institution directors were unanimous in their praise for the high quality of the exhibits, the beauty of the works and their excellent presentation as well as the good number exciting discoveries that arose from the exploration of the Central European scene. Firmly anchored in a rich historical ground, the Czech, Polish, Hungarian, Slovenian and Slovakian scenes are today undergoing a renaissance. In addition, the exhibitions of the finalists of the BMW-Paris Photo Prize, Leica Camera’s show A Juste Titre as well as the SFR Young talents show won many accolades from the public. This year Paris Photo coincided with a number of key auctions, including the Avedon sale at Christies’ and a big auction at Sotherby’s. 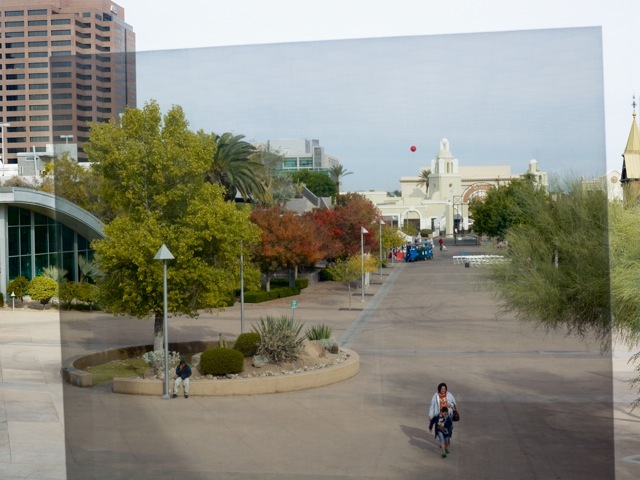 It also took place in the context of the 30th anniversary of Photography Month which offered a plethora of exhibitions throughout the city, in addition to a number of "Off" fairs and happenings. 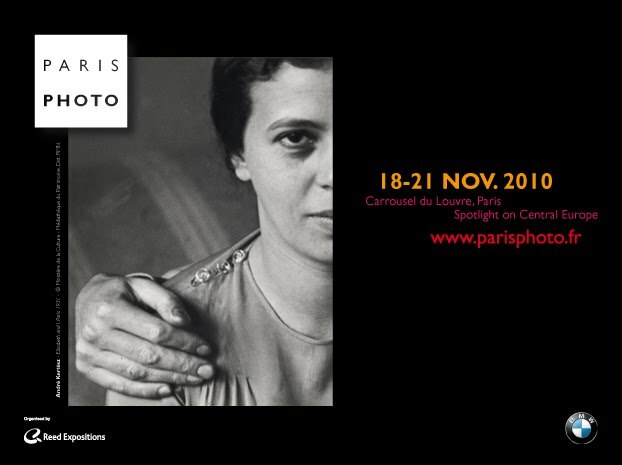 More than ever, Paris Photo is the world’s leading event for photography and Paris is its global capital in November. 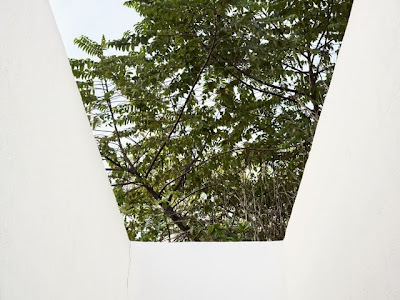 * A writer, art critic and independent curator, Simon Njami conceived the exhibition Africa Remix, the first Africa pavilion at the Venice biennale in 2007 with Fernando Alvim. He was also behind A Collective Diary (Tel Aviv 2010) and A Useful Dream, fifty years of photography in Africa (Brussels, Palais des Beaux-Arts, 2010). Njami was co-founder of La Revue Noire and served as its Chief Editor. He was director of the Bamako biennale for 10 years and his latest book is a biography of Léopold Sédar Senghor (Fayard, 2007). Just a girl giving birth on Google Street View that´s all! Or is it a fake? Who knows, maybe Mr Crewdson is at it again? The Magenta Foundation have announced Year Seven of its Emerging Photographers exchange. This is an open call for submissions. All photographers in Canada, the UK and the US 34 years of age and under may submit. All submission requirements and instructions are located on their website but we´ve also listed them below. The Bright Spark Award winner will receive $5,000. As in the past, all competition Winners and Honourable Mentions will be published in a high quality catalogue. Along with being published, select 2011 Flash Forward Winners will be featured in a touring exhibition. In January 2011, a significant additional component will be announced to complement the program’s alternate festival years. Stay tuned and sign up for their newsletter. Submissions open on Wednesday 20 October, 2010 and close on Friday 31 December, 2010. Format: .jpg, .gif or .png only. Please be aware that your files will be viewed by the jurors on the web, and if you submit files in .tif, .psd or other non-web-viewable formats, they will not be visible and you will be disqualified. Size: 700 pixels on the longest side, and a file size NO larger than 500 kb. The caption/title, medium and dimensions for each image you intend to submit, including English translations if the captions are not in English. These do not need to be directly attached to the image file in any way - the image upload form provides fields for filling this information in. Please choose the images that you submit from a concise body of work which you feel best represents the style you work within. 2. An artist's statement regarding your work. 3. A brief one-paragraph bio suitable for use in a book or exhibition catalogue. 4. A complete CV (curriculum vitae) focussing on your artistic career. Your complete contact information, including address, phone number, e-mail, web address if any, etc. Go to their website to fully familiarise yourself with their guidelines and why not begin your submission today? 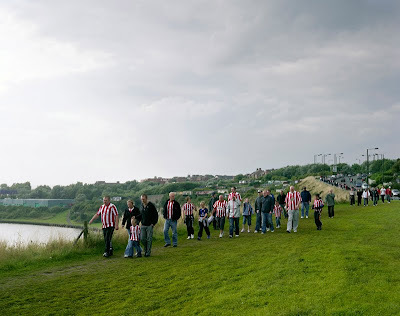 It is a great honour to be able to announce the latest addition to the 1000 Words Collection, a work by by Simon Roberts, Sunderland vs. Liverpool, Sunderland, Tyne and Wear, 16th August 2008. (We English). NB: Printed on Fuji Crystal Archive paper. The print is both signed by the artist and comes with a certificate. It is number 2 from the edition. The print is produced with a white border around the photograph to allow for framing. We also have included some cotton gloves to protect the print during handling. "The Arts have been under the spotlight recently as the impending cuts in state funding has fuelled much anxiety about the future of the creative industries in the UK. The axe finally fell with the announcement in the Comprehensive Spending Review of a nearly 30% drop in funding for The Arts Council. The impact this loss of funding will have has spawned gloomy forecasts about the inevitable closure of theatre companies, art galleries and local art projects. What I have yet to read about are all the initiatives and projects that have never been supported by Arts Council England and how they manage to find ways to fund their commitment and passion for good art. Our partner 1000 Words is one such organisation, who through an excellent quarterly online magazine has managed to raise the level of writing about Art Photography and through collaborations with ourselves and Magnum Photos,(neither of which are funded by Arts Council England)has developed new ways to support their project. So our message this week is there will inevitably be casualties of such a savage cut in funding, but this may also open up new ways to fund worthy organisations and we hope that our own Collections initiative will become the kernel of a new way to support art in the future." As a not-for-profit organisation the net proceeds from all sales of limited edition prints in the 1000 Words Collection will go entirely back into supporting 1000 Words Photography Magazine and help finance our extended programme of exhibitions and events including workshops; portfolio reviews; talks; panel discussions as well as prizes and awards. 1000 thanks to both Simon, and Bridget and Michael of Troika Editions for supporting us! Seeing as there is a bit of a street photography theme going on round here of late, I thought I´d share some information about the Street Photography Now Project, a collaboration between The Photographers’ Gallery, London and Sophie Howarth and Stephen McLaren, authors of Street Photography Now (Thames and Hudson). 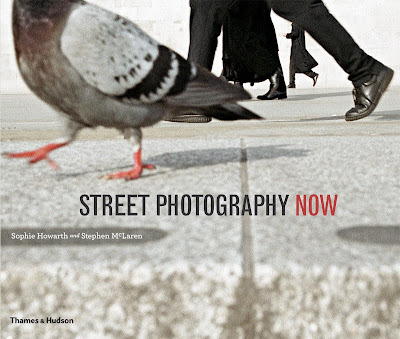 Each week from 1 October 2010, a leading contemporary street photographer has issued a new instruction, written to inspire fresh ways of looking at and documenting the world we live in. Over the following six days, photographers around the world are invited to upload one photograph in response, to a special Flickr Group. After six days the next instruction will be issued. See the Take Part section of the website for more details on how to contribute. The Project will run for 52 weeks, and you can join in at any time. The aim is to build a global community of photographers exploring the rewards and challenges of documenting public life. All photographers, including those who contribute to the Instructions, will be encouraged to comment and respond to the images posted to the Flickr groups. Though not a competition, at the end of the Project one photographer will be chosen who has made the most outstanding contribution to the project across a number of weeks. They will be awarded £1000 of Thames & Hudson books and have their work displayed on The Photographers’ Gallery digital Wall for All. The Street Photography Now Project was launched in September 2010, as The Photographers’ Gallery closed its doors for the redevelopment of its building on Ramillies Street. The Project will run for one year and is scheduled to end when The Photographers’ Gallery reopens in late 2011. This video clip is always worth revisiting. Broadcast from his home in New York, American artist Philip-Lorca DiCorcia confesses how he hunted the subjects of his series Heads that were recently on display at Tate Modern in Exposed: Voyeurism, Surveillance and the Camera. Accomplished street photographer John Maclean has been on our radar for some time now. Born in Buckinghamshire in 1969, John spent part of his childhood in Canada and the United States. Apparently, he began using a camera at the age of 14 when he discovered the book American Images, featuring the work of Garry Winogrand, Robert Frank, Lewis Baltz and John Gossage. After studying mathematics, physics and geology he went on to graduate in photography at the University of Derby. He subsequently worked at The Royal College of Art for four years. John has been a London-based, freelance photographer since 1998, using commercial commissions to support an independent, fine-art practice. His photographs have been widely published in books and periodicals and he has self-published six books – held in the National Art Archive at The Victoria and Albert Museum and private collections. The images shown above are taken from his latest project, simply titled City. 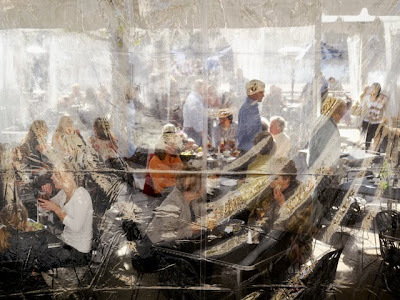 "The intention of this body of work," says Maclean "is not to document specific cities or individuals – it is an endeavour to construct my own city through photographs." "City is a place pieced together by utilising both photography’s assets and its limitations – it is consciously photographic. The resulting worldview is a sparsely populated, absurd theatre. A stage set of caves, screens, portals and ambiguous landscapes. A city built on the foundations of an inherently surreal medium that can’t help but veil, dislocate, displace and abstract." In the run up to Christmas (yes we can´t ignore it much longer) why not treat yourself or a loved one to one of his fantastic limited-edition book projects? Check out the complete list on his website and order yours now. 1000 Words tour of Rebecoming, led by Tim Clark, Flowers Gallery, London, Saturday 11 October 2014, 3pm.